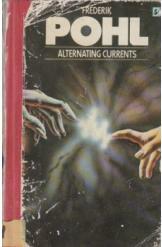 Alternating Currents by Frederik Pohl, Sci Fi. Book is in good condition, all pages intact. A collection of short stories by the science fiction and horror author Frederik Pohl. Includes "The Children of Night," "Let the Ants Try," "The Ghost-Maker," and seven others.